Chinese Cultural Center, situated in the southwest part of Port Louis, capital of Mauritius, is a group of buildings in traditional Chinese style. Built in July 1988, it covers an area of 9,600m2. The Center includes administration office, reception room, theatre hall, library, reading room, exhibition hall, dance studio, classrooms for the Chinese language course and music teaching, video room and floodlit court, etc. China Cultural Center has many books, films, videocassettes, photos and handicrafts. It is a window through which the Mauritian people understand Chinese culture. The Center offers courses in the Chinese language, dance, and martial arts all the years round. Teachers with rich experience both on teaching and practice are invited to the Center from China to serve wholeheartedly the Mauritian people by imparting Chinese language and culture, dance and martial arts. The aim of the Center is to introduce Chinese culture and arts to the Mauritius and China, and to enhance the understanding and friendship between the two peoples. For the past ten years, many cultural activities have been held at the Center including arts exhibitions, cultural shows, lectures, symposium, receptions, film soirees, Chinese Film Weeks, Chinese Culture Days, etc., and we have played hosts to thousands and thousands of guests. It is a greater pleasure for the Center that the President off Mauritius and his wife, the Prime Minister of Mauritius and his wife and many ministers graced the Center several times. 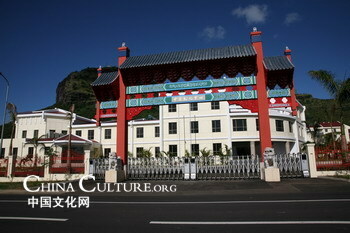 It shows the great importance that the Mauritian government attaches to China Cultural Center. The Center has also given enthusiastic support to many cultural activities organized by the government and non-governmental organizations of Mauritius. China Cultural Center has made its positive contribution to the development of the cultural exchanges between China and Mauritius and to the reinforcement of the friendship.